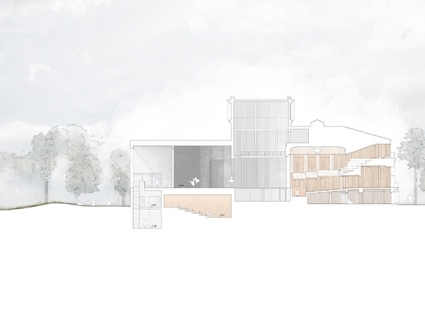 In a limited competition for the extension of Landskrona Theatre, the proposal by JCA has been selected. The proposal includes a cinema, black box, terrace, bar and café. 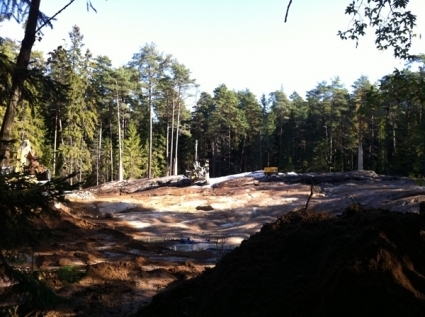 The new crematorium at the Woodland Cemetery will be finished in February 2013. 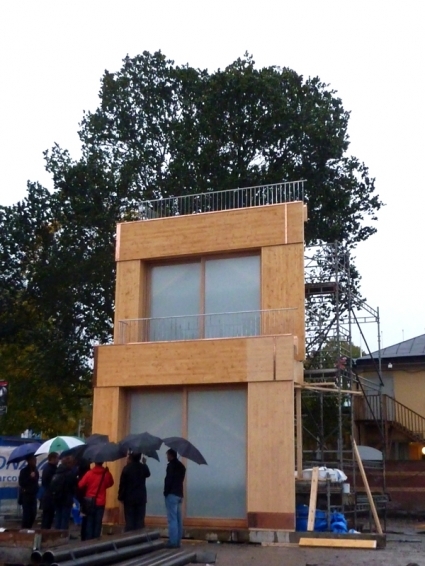 A full scale prototype of a part of the facade has been built at the site at Djurgården. The proposal for kv. 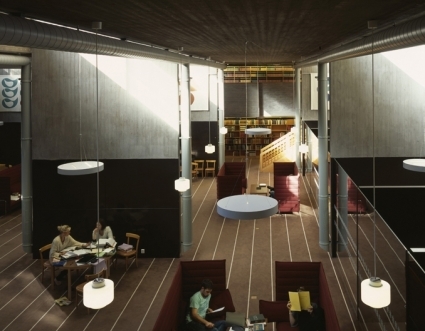 Munken in Uppsala by Johan Celsing arkitektkontor has been selected in a limited competition. JCA is developing kv. Munken for The Uppsala University Foundations Management of Estates and Funds (Uppsala akademiförvaltning). 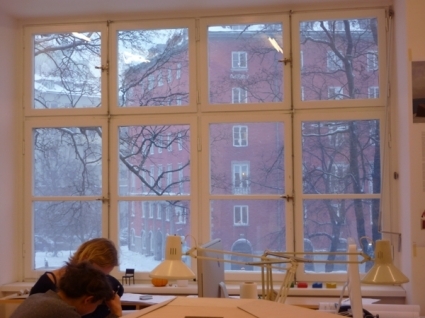 The site is located in the historical center of Uppsala with a proposed mix of housing, education and commercial use. Most of the existing buildings (6000 sqm) are protected and dates from 18th century to the 1930s. Three concentrated additions (5400 sqm) are suggested to accompany the existing ensemble of buildings. 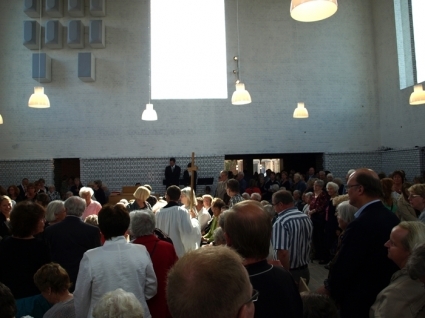 Excerpts from a video documentation of the construction of Årsta Church. 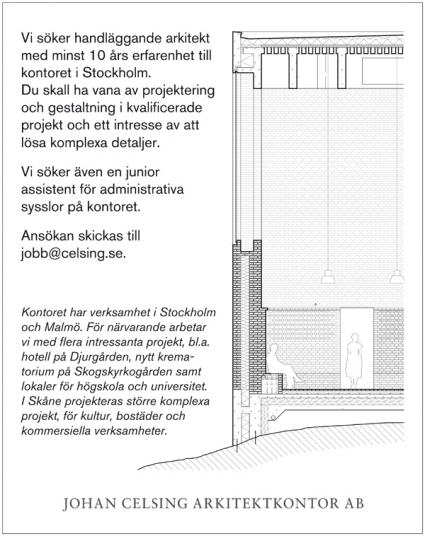 In a limited competition Johan Celsing Arkitektkontor has been selected for the design for a new 55-room hotel at Djurgården in Stockholm. The location is next to the Liljevalchs Art Gallery on the former Lindgården restaurang property. The exterior of the new hotel has glue-laminated beams. The building is characterized by the terrassed exterior where the rooms have small individual outdoor terrasses. On the invitation from Ware professor of architecture, Kenneth Frampton Johan Celsing will present current works such as the ongoing project at the Woodland Cemetery in Stockholm. Celsing will be one of the speakers in the panel for the event: Common Ground, Current trends in contemporary Scandinavian architecture. Other speakers include Kenneth Frampton, Craig Dyker of Norwegian practice Snohetta, Eva-Liisa Pelkonen, associate professor at Yale School of Architecture. The event will be moderated by Nicholas Adams, professor at Vassar College . The event coincides with the ongoing exhibition of Scandinavian architecture and design at Scandinavia House in New York City. 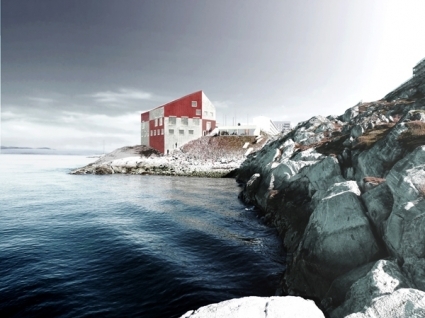 The Jury decision in the invited competition for a new National Gallery of Art in the capital of Nuuk was announced last week. The competition had invited the following practices: Snøhetta Norway, Studio Granda Iceland, Heikkinen+Komonen Finland, Tegnestuen Nuuk Greenland, BIG Denmark, Johan Celsing arkitektkontor Sweden. 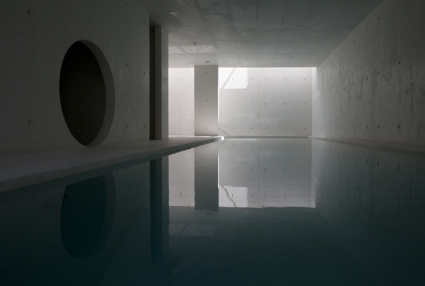 The jury selected the scheme by BIG as the winner of the competition. 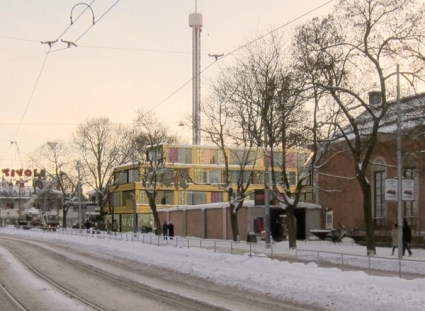 The image presents an exterior view of the proposal from Johan Celsing Arkitektkontor. As a result of an invited competition in 2005 Johan Celsing Arkitektkontor are currently developing the tender documents for the new hotel, cinemas and an apartment building at Konsul Perssons plats in Helsingborg. The hotel, Hotel Park Inn will have 210 rooms, there will be 7 cinemas run by SF, Sveriges Filmindustri and some 90 apartments. The developer for the project is Midroc. The image shows the facade of the apartment building at Järnvägsgatan. 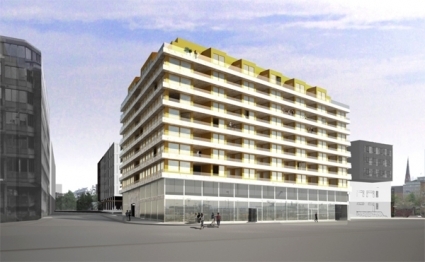 On January 20th, the project was approved by the building authorities of Stockholm. 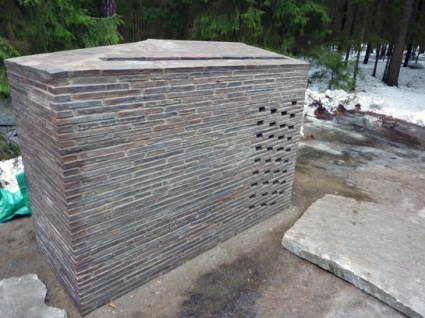 Construction will start in the summer of 2011.
for the coolers has recently been built at the building site at the Woodland cemetery. 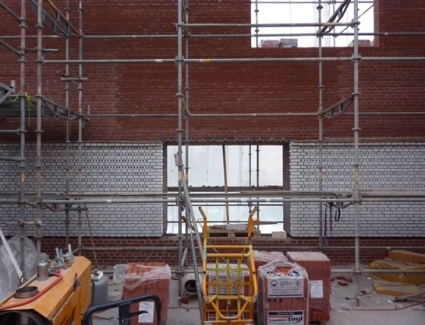 The construction of the new church is under way.